Taichung Confucius Temple is the latest built Confucius Temple in Taiwan. The temple’s distinct architecture features elements from Song Dynasty while other Confucius Temple in Taiwan is built by the elements of Qing Dynasty architecture. Both the Confucius Temple and Martyr’s Shrine are located near the junction of Shuanshih Road and Lishin Road. Adjacent to each other, both buildings are majestic and grandiose which bring the visitors peaceful and magnificent feelings. 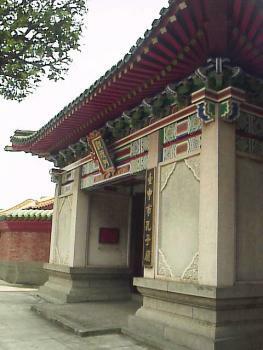 The entrance to Confucius Temple is at Shuanshih Road, where two monumental archways guarded the entrance. The main chamber of the temple is dedicated to the impeccable scholar, Confucius himself. And, the annual Confucius’ Birthday Ceremony (Teacher’s Day) takes place at the main chamber of the temple, which holds performances and is one of the grand events to join. Next to the Confucius Temple is the Martyr's Shrine, which dedicated to patriotic heroes. The Martyr’s Shrine features for a majestic gateway and cypress-lined walkway. If you are enjoying the historic monument, Taichung Confucius Temple should be one of must-visited attraction on your list for your Taichung Travel. From Chungching Highway Interchange, exit to Taichung City. Go along Taya Road towards the city direction. At Chianshin Road, turn left and go straight. Then connect to Peiton Road and right turn to Shuanshih Road southward and you will reach the temple. Walking: From the train station, head northwest on Zhongzheng Rd. for 100m. Turn right at Shuangshih Rd. It's about 1.8km to the temple. On you way, you'll pass Taichung park and a statium. By Bus: Taichung Bus Company, 40, 41, 63 and Renyou Bus Company, 20, 53. © 2019 Alice Hotel. Powered by DFone Technology Corp.